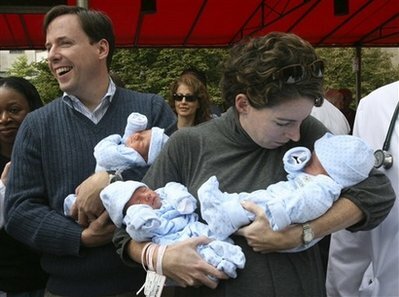 Home » NY Couple Welcomes Home Their Identical Triplets! Kerry and Desmond Lyons were all smiles today as they left a Manhattan hospital headed for their suburban home. The couple welcomed a rare set of identical triplets, who were conceived without fertility treatments, via Caesarean section on Friday. The three tiny newborns Kevin, Declan and Cormac Lyons rolled out of NewYork-Presbyterian Hospital/Weill Cornell Medical Center in style, wearing matching blue hats, asleep in a stroller that looked something like a stretch limo. Twins, triplets and quadruplets have become much more common over the past few decades because of fertility treatments, but identical triplets are still rare. Some scientists estimate they occur in as few as 1 in 100 million births. Others peg the number higher, at 1 in 500,000 or even 1 in 64,000. Whatever the odds, Kerry and her husband, Desmond, said they were thrilled with the outcome, even if they can’t tell the boys apart yet. “My suggestion was to put tattoos on them,” joked their father. For now, they’ll wear ID bracelets. Kerry Lyons said she gained 50 pounds during her 36-week pregnancy. A lot of that was baby; combined, the youngsters weighed a little more than 16 1/2 pounds at birth. When they get home, the babies will share a crib for the time being, to keep them cozy. The couple already has two children, ages 2 and 4. As for the prospect of managing five children during an economic downturn, their mother said she isn’t worried. “I think this is God’s way of turning me into an easygoing type,” she said. Lisa Bonet Expecting Baby #3!